DAITO-RYU Jujutsu is believed to originate from a ninth century Emperor. The art was passed down through the family descendants and a general in the eleventh century who greatly expanded and refined the techniques. Shinra Saburo Minamoto no Yoshimitsu made careful anatomical studies on battlefields and execution grounds. He dissected dead bodies and probably tested strikes, blows, holds, joint locks and pins on criminals who were going to be executed. In my opinion, the art was being developed so if the samurai lost or broke his weapons, he could go right on killing without a weapon until he could obtain another weapon. This history of Sokaku Takeda is a compilation and compression of articles from my old Aiki News and Aikido Journal magazines. The story is so much clearer now when I can read everything together and not wait for months between articles. Sokaku Takeda was about 9 years old when the Meigi Restoration took place. There was a rebellion of samurai who felt Japan was making changes that did not benefit the country. Both sides were made up of samurai and everyone respected the Emperor, and everyone believed what they were doing was for the good of Japan. However, it boiled down to old clan power struggles with the Emperor supporting the progressive side while the Shogunate military government supported the past traditions which made them rebels. This led to a short civil war that was mainly swords, spears and arrows against rifles and cannons. The Ainu clan was the last hold out and they were driven into a last stand area and castle. Sokaku's family was well to do in this prefecture, but the mansion was deserted except for Sokaku. He knew where the rebels were pinned down and was able to pass through the army lines to observe the rebels holding out in the castle that was under siege. He did this for nine days. The soldiers at the road blocks would catch him, but let him go because he was so small. He was taught Daito-Ryu by his grandfather. Sokaku was not a good student. He learned well by listening and watching but did not like reading and writing and did not want to learn this. He wanted to be like Hideyoshi who had others read and write for him. When the teacher was out of the room, Sokaku would pretend like he was a general and command the other students while standing on a desk. He very definately enjoyed learning fighting arts. In the end his father felt that Sokaku was distracting the other students from learning and so he was finally thrown out of the school his father ran. Sokaku's father, who was an accomplished sumo wrestler in addition to running the school, also had a stable of sumo wrestlers. Sokaku grew up around these wrestlers and they naturally taught the boy what they knew. Sokaku became a very good sumo wrestler at a young age despite his small stature. In his teens he would go around to festivals held in surrounding villages and regularly won all the trophys. It got to the point that his father would forbid him to go to the festivals because Sokaku's actions discouraged other boys from practicing sumo. When Sokaku was a young man, there was supposed to be another uprising in Southern Japan and Sokaku made his way towards the area with the intent of joining, but never made it before the situation was diffused. He then started wandering around Japan like a ronin shugyosha (masterless traveling martial arts student and teacher). He "stormed" (challenged) many dojos testing his knowledge and skills and supposedly never was defeated. In the process he killed a number of men. By the 1910's Takeda Sensei was living and teaching in Hokaido, which in those times was similar to the frontier of the American Wild West except with swords as the main weapon. At the turn of the 20th century Japan was colonizing Hokaido and sent everyone they could, so it was populated with colonists as well as convicts and other rejects from the central islands. When I started in Aikido, I read a very interesting story in Aiki News (precursor to Aikido Journal) about Sokaku Takeda as a coal mine strike breaker. The coal miners (probably convicted prisoners sentenced to work the coal mines) were in one end of town and they knew Sokaku was at the other end of town sharpening his sword. The miners decided to go back to work, but they had to draw straws to determine who was going to let Sokaku know they would apologize and go back to work. The short straw man started crawling from his end of town, apologizing loudly and bowing as he crawled on his knees, pleading that Sokaku not kill them all. It was about this time (Feb 24th, 1915) that Morihei Ueshiba was introduced to Sokaku and Ueshiba immediately devoted 40 days to training with Takeda Sensei and learning as much as he could of Daito-ryu. (Consider this was in the winter and there was not much that could be done outside that far north.) When Morihei got back to his home in Shirataki, he started getting together young people to practice and soon invited Sokaku to come and teach. Ueshiba soon became one of Sokaku's top students and a relationship that lasted about 30 years developed. When Ueshiba got word that his father was dying, he gave his house to Takeda Sensei and started a move back to Ueshiba's home town. On the way to his father, Morihei met a man on the train who told him of a very special, relatively new, religion that healed many people. Morihei detoured to Ayabe where he met Onisaburo Deguchi, a devout holy man, who told him his father would be just fine (meaning he was going to a better place). Morihei was very impressed with this man and moved his family to be near him and learn from him. He devoted his life to the Oomoto religion that Deguchi had co-founded and became a close friend and body guard for Deguchi. 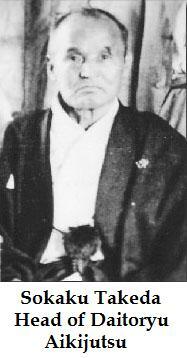 In turn, Deguchi encouraged Ueshiba to teach Daito-ryu. Sokaku would visit Ueshiba occasionally and stay and teach Daito-ryu for extended periods, which strained their relationship. In addition to this Deguchi encouraged Morihei to distance himself from Takeda, because he considered Sokaku to be a "bloody" man. He also impressed Morihei to modify the techniques to not be so debilitating. The Oomoto-kyo religion was growing very fast and the teachings of peace and love and following directives from God, instead of the Emperor, disturbed the expansionist government, so there was a crackdown. Morihei was teaching a number of military officers and had to distance himself from Deguchi to keep from getting arrested himself. He moved to Tokyo and opened a dojo there. Sokaku would still visit and continued the long stays. Some of Ueshiba's early students described Takeda Sensei as being a fierce instructor. One described Takeda's sword draw as sounding like a zipper being ripped open. Sokaku continued to teach in Hokaido (Northern Japan) until the end of his life at 83. His son, Tokimune carried on the Daito-ryu training in Hokaido. Morihei Ueshiba began to change his ideology and changed the name over time to Aikido, but the influence of the original techniques is still very strong in the Iwama Style of Aikido that was carried on by Morihiro Saito Sensei. The art that Ueshiba was teaching his senior students as he got older was very high level Aiki techniques that did not have the same martial spirit of earlier techniques. Even while Ueshiba was alive some were saying the art was being watered down and loosing it's effectiveness as a "Budo". My hypothesis for this is that the junior students watched the advanced techniques and started doing those techniques before they clearly understood the basics. Morihiro Saito Sensei stressed basic techniques as he continued to teach in O'Sensei's dojo in Iwama. The Iwama Style techniques closely resemble the Daito Ryu techniques and the Iwama Style feels much more effective than the majority of styles I have felt in various places and countries I have visited. Here are some videos I found on the internet of Daito Ryu instructors. (Click on the link to go to that web video.) I am not copying them, I am giving you the links of what I have found. There is no guarantee that all links are still active.